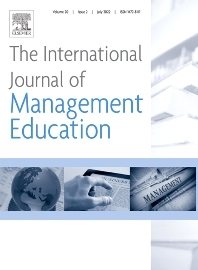 The International Journal of Management Education provides a forum for scholarly reporting and discussion of developments in all aspects of teaching and learning in business and management. The Journal seeks reflective papers which bring together pedagogy and theories of management learning; descriptions of innovative teaching which include critical reflection on implementation and outcomes will also be considered. • Globalisation of business and responsible management education in advancing the United Nations Sustainable Development Goals. By promoting critical discussion on current innovations within these areas, the journal represents an excellent forum for highlighting the profile of management education on both a national and international level. The International Journal of Management Education is the outlet for educational research and developments within business, management, accountancy and finance.